We carry "Jamila" brand henna. It is a superior product of guaranteed no-sift, expertly milled powder which produces dark stains for both skin and hair. When it comes to pre-mixed henna paste, quality and freshness are key. Henna dye has a shelf life... therefore, most store-bought henna paste and do-it-yourself kits leave much to be desired in staining ability, consistency and safety (most contain chemicals which are not skin safe, including toxic dyes and high levels of lead... read more about it here). We carry professional-grade, properly stored henna paste containing lemon juice, sugar, tea tree and lavender essential oils... made fresh to order. Our henna kits include everything we use ourselves; safe, quality ingredients, thorough and easy to follow instructions, applicators, and sample designs. Produces approximately 3 henna cones. 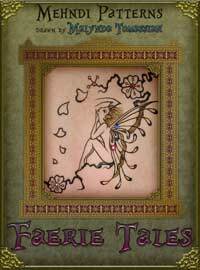 A book of 21 patterns featuring imps, goblins, faeries, and mermaids designed for beginner and intermediate artists. 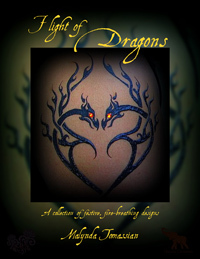 A book of 17 dragon patterns designed for beginner to intermediate artists. To order, please email me directly or fill out the handy form here.